This entry was posted in All Ideas and tagged NICK short positions tender offers on January 7, 2015 . 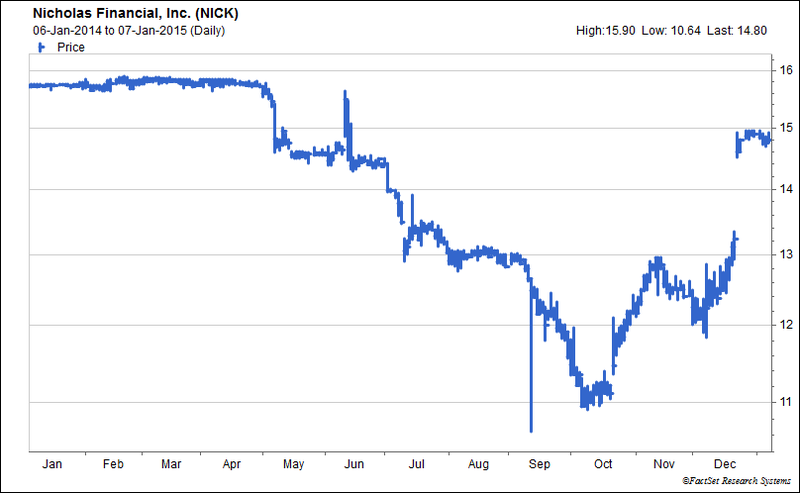 You would think the long-suffering shareholders of Nicholas Financial would understand risk arbitrage after an acquisition proposal for $16.00/share from Prospect Capital collapsed last June. Shares fell over 30% to below pre-acquisition levels, prompting the Board of Directors to once again consider strategic alternatives. The outcome of that process was an early Christmas gift for shareholders. On December 22, the company announced its intention to commence a modified Dutch tender offer within 30 days for up to $70 million, or between 36-39% of its outstanding shares. The proposed tender offer range is between $14.60-$15.60, with a $50 million minimum tender condition. Two weeks after the announcement, NICK closed at $14.87, well above the low end of the range. However, the offer has not yet commenced. In my opinion, the current price reflects little or no risk of the transaction failing to be consummated. NICK had just $5 million of balance sheet cash at last report. Although the company is relatively conservatively levered at ~0.5x debt to financial receivables, it will have to raise additional financing to fund the buyback. Surely I’m not the only observer who raises an eyebrow at a debt-financed buyback for a subprime lender at what could well be the peak of the credit cycle. The company’s CEO has voted with his feet and indicated plans to tender in the offer. To be sure, NICK appears to have a decently profitable business, and a buyback is notionally accretive for continuing shareholders, depending of course on how it is financed. Admittedly, I know very little about the company’s underwriting standards and the competitive environment in its particular niche of the consumer lending industry. But I do know that the risk/reward here is favorable. This is a trading position rather than a bearish take on the underlying business, but from a portfolio perspective it is welcome short exposure at low cost. Because of the minimum tender condition, the offer is unlikely to be completed if it trades above $15.60. Assuming the offer is initiated as planned, the risk to the upside during the pendency of the offer is thus approximately 5%. (Barring an upward revision to the offer range, which I consider unlikely). Meanwhile, markets are fickle, and a number of events could cause shares to drop back to the $12-13 range. In the event credit markets seize up or the company has difficulty arranging financing, there is a possibility the offer may not be consummated at all. Even after being initiated as planned, the offer could be terminated. These are tail risks and not the most likely scenario by any means, but they are the reason most tender offers at a premium to market prices trade at a significant spread. In my view, market participants should price NICK at a discount to the $14.60 tender offer floor. I believe shareholders are likely to tender at the low end of the range, considering where shares were trading prior to the announcement and the recent history of the company. Clearly, the Board’s pursuit of strategic alternatives did not result in another bidder willing to pay close to $16 per share, or the company would not have pursued a buyback instead. $14.60 is a gift. This entry was posted in All Ideas and tagged FSIC long positions tender offers on June 5, 2014 . Disclosure: No position in FSIC. This post has been edited to remove details of trading activity. This post is intended to follow up on prior analysis and should under no circumstances be considered an advertisement for the performance of past specific recommendations. I closed a post about a tender offer last month by saying, and I apologize for quoting myself, “…it would have been possible to accumulate and successfully tender a lot more than 99 shares. Food for thought.” In truth I was thinking of a particular opportunity at that moment. FS Investment Corporation (FSIC) had an ongoing tender offer that I did not wish to publicize, as more participants would increase the odds of proration. I believed that the tender was unlikely to be significantly prorated, despite occurring at a significant premium. A holder could potential tender large amounts of stock at a premium, without worrying about a potential decline in price afterwards. FSIC was conducting a Dutch auction between $10.35 and $11.00, while trading around $10.15, well below its net asset value of $10.27. 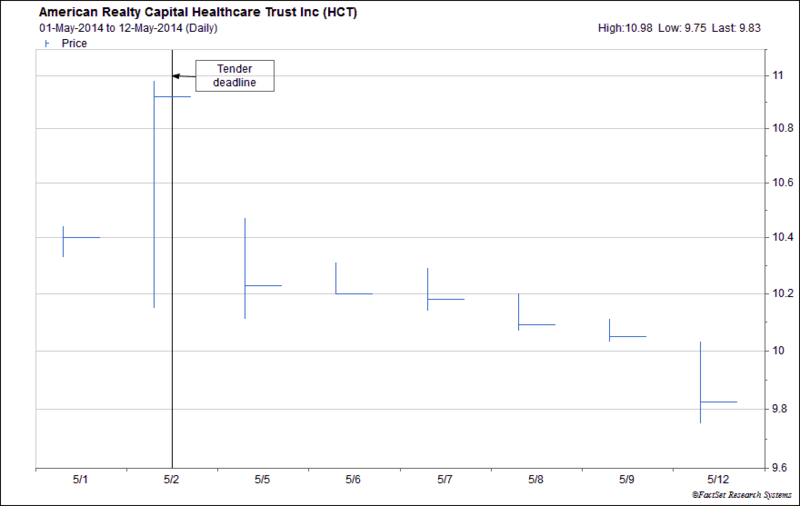 The tender closed on May 28th, and sure enough, the company bought back 96% of tendered shares at $10.75. In short, FSIC was an unusually good setup for a tender offer, and based on the size of the offer, it was highly scalable too. I estimate it could have contributed meaningfully to funds as large as $200 million AUM. Such opportunities do not come along very often! This entry was posted in All Ideas and tagged GLRI long positions tender offers on March 29, 2014 . The transaction closing date has been postponed a few times and is now scheduled to be completed on April 10. Meanwhile, Glori completed an oilfield acquisition, likely representative of its strategy going forward, through a $40m deal with Petro-Hunt. The closing delay is related to unspecified SEC requirements; my best guess is that Infinity received SEC comments requiring a response and/or was required to provide investors more time to evaluate the Petro-Hunt deal. About a week ago, the warrants traded up to 77 cents, which is still a significant discount to the common but provides less of a margin of safety. Since then, the warrants have been very illiquid. Remarkably, there have been no trades at all for the past 3 trading sessions, a good illustration of why this particular situation is best suited for small accounts. Even small accounts can miss out; since Cable Car manages separate accounts for each client, I have yet to establish a position for one of my most recent clients. That in turn provides an interesting illustration of the pros and cons of separate accounts. On the one hand, my newest client may not be able to participate in this particular investment opportunity. On the other hand, in a pooled vehicle, earlier clients’ proportionate share of the position, provided I could not increase it, would be unfairly reduced by new capital. Of course, one’s perspective on the benefits of participating in any particular idea depends entirely on how it turns out. If the transaction is not completed and the warrants are ultimately worth only 60 cents, perhaps my new client got lucky! I would still happily buy more INXBW around 70 cents, but at the moment there are no sellers. I have some ideas for how to think about the value of the post-transaction entity, which is somewhat challenging to value. In order to avoid contributing to further lack of buying opportunities, I will refrain from discussing them until after the transaction is consummated. This entry was posted in All Ideas and tagged GLRI long positions tender offers on March 2, 2014 . Disclosure: Long INXBW. Please be sure to read the disclaimer — no content on this blog is investment advice. This is a post originally shared on the investment ideas forum SumZero. It is a relatively illiquid opportunity suitable only for small accounts, but it describes an interesting corner of the stock market. In brief, an investor can buy warrants in Infinity Cross Border Acquisition Corporation (INXB) for about 70 cents today, which will be convertible into shares worth 80 cents in 6 weeks. There is downside to 60 cents in the event a planned merger with Glori Energy falls through and further upside if investor demand for Glori is high after the transaction. Back in 2009, when cash was paramount and everything was on sale, SPACs (special purpose acquisition companies, i.e. blank check firms that IPO with a mandate to reverse merge with another company later) became a popular arbitrage vehicle for those who still had funds to invest. A SPAC is typically structured so that the initial investors have some sort of opportunity to get their money back if they disagree with management’s proposed acquisition. Usually this protection is in the form of a mandatory tender offer at the IPO price and/or a liquidation right, again at or near the IPO price, if a deal is not approved by shareholders and consummated by a certain date. During the financial crisis, the price of many SPACs that had yet to find their acquisition targets dropped well below the IPO price, offering investors a low-risk opportunity to buy below cash and then take advantage of the liquidation right or tender once a deal was announced. This often resulted in the deals failing to close, but the original shareholders were usually long gone and the arbitrage could generate 10-20% returns in a matter of months. There was a certain poetic justice to this, as SPACs are a great example of Wall Street’s excesses. Why do your own diligence on an IPO when you can fund a shell company to do it for you? Why pay a private equity firm fees to manage a portfolio of private companies when you can pay an often untested management team $10-20m in stock options to buy just one? Often the proposed acquisition target won’t even be in the same industry as the SPAC initially planned. The structure has a colorful history too, as it was first used by (often fraudulent) stock promoters in the 1980s before becoming discredited and more heavily regulated. It reemerged during the last decade with the protections just described, and it was a popular IPO vehicle during the boom. There was a great Steven Davidoff article on a recent SPAC IPO that describes the history in more detail. Enter Infinity Cross Border Acquisition Corp, traded on the NasdaqCM as INXB, INXBW, and INXBU for the common, warrants, and units (common plus warrants) respectively. Backed by the Infinity Group, an Israeli-Chinese private equity firm, it was originally supposed to buy something in China. But no matter — the SPAC eventually identified an interesting oil extraction technology start-up to buy and take public, Glori Energy. Glori’s VC backers will retain a controlling stake and take INXB shares at the IPO price of $8, with customary lock-ups. Infinity and the Thomas Hicks family office are buying additional shares at that price as well. There is downside risk below 60 cents if INXB trades below $6 after the transaction. However, with the major investors injecting capital at $8, equivalent to an 80-cent warrant price, buying warrants at 70 cents is like buying into the offering with a $1 margin of safety. Glori could be a very interesting business if its technology really performs as advertised at scale. Glori has a proprietary biomass system called AERO that is supposed to reduce the decline rate of older oil wells under certain conditions. In principle, this means Glori can purchase a well at standard industry multiples based on the usual recovery rates, then apply its technology and ultimately extract more value from the well over time than the seller could have. The plan is for Glori to roll-up small producing wells with the right geological characteristics — yes, including some in China — monetizing its technology by applying it in the field. If the investor presentation (Jan 9th 6-k exhibit 15.1) is to be believed, Glori may be able to achieve IRRs in excess of 40% on well acquisitions assuming AERO performs as intended. As an aside, I personally have limited expertise with oil & gas exploration and have no real way to evaluate the technology. It apparently works in some pilot projects, but whether it will scale and Glori’s acquisition strategy will be successful is not a question I have tried to answer for this arbitrage situation. I would welcome comments from anyone with a background in exploration & production. Back to the opportunity today: unlike many SPACs that required majority shareholder approval and ended up in mandatory liquidation rather than consummating a deal, Infinity learned its lesson from SPAC arbitrage and has a relatively lenient standard in its articles of association for the transaction to proceed. The maximum tender condition is set such that INXB must retain at least $8m in its trust account. In other words, a maximum of 4.75m of the 5.75m public shares may be tendered into the deal, or 83%. Only 17% of the public shareholders need hold onto their shares for the deal to close. That said, there is still a meaningful risk that the deal does not go through. SPAC arbitrage is still popular, even when the discounts to liquidation value are quite small, as in the current environment any yield is potentially preferable to sitting on cash. For example, INXB common shares currently trade at $7.95 and traded as low as $7.60 early last year, versus an $8 IPO and mandatory tender offer price. It is probable that a substantial number of arbitrage funds who hold INXB will tender into the deal. Based on available filings as of 9/30, it appears that 13-F filers and mutual funds that are or might be arbitrage funds own approximately 2 million of the shares outstanding, but there could be other, smaller arbitrageurs who are not required to disclose their positions. 824k shares were tendered through January 31. If the deal closes, the tenor and strike price of the warrant change, but they also gain a conversion right during the 30 days after the transaction closes. 10 warrants are convertible into 1 share of stock, so provided INXB continues to trade around $8 after the deal, the warrants would be worth at least 80 cents. If the deal fails to close, the company will liquidate and the warrants will be worth 60 cents in liquidation. There is a parallel tender offer for warrants at 60 cents but it does not affect the maximum tender condition. INXBW currently has an ask of 70 cents, so the situation sets up a risk/reward trade-off of 10 cents down, 10+ cents up. Although there is a risk that too many shares tender, Infinity and the other deal participants are highly incentivized to ensure that the transaction closes. I’m betting they can convince $8m of investor capital to participate in the deal. The tender expires on March 17, and the warrants become convertible for a one-month period beginning 31 days after the transaction closes.